Weather forecasts predicted light easterly breezes under high pressure which failed to put of many Finn sailors for the final British Finn Association event of 2016 as 32 boats turned up! 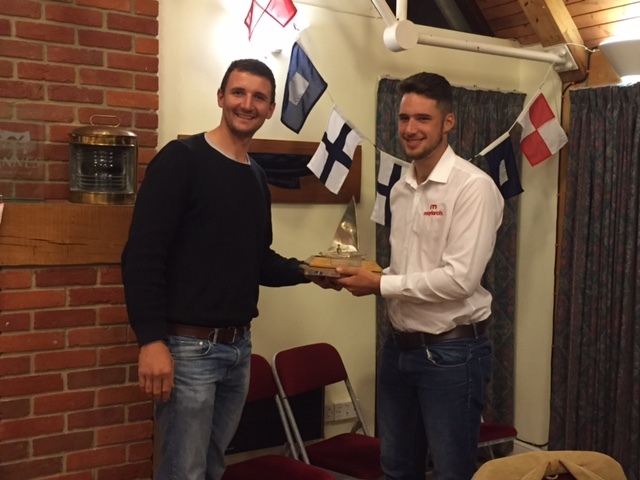 The annual end of season event held at Warsash Sailing Club has become a popular tradition with Finn sailors. It is an opportunity to have a great weekends sailing and to pay tribute to a great year with the annual dinner. This year there was little to disappoint. Saturday morning commenced with the normal briefing delivered by Nigel Russell the PRO and Commodore of Warsash Sailing Club. Thankfully questions about the sailing instructions were dealt with very quickly and the fleet set sail for the race area off Solent Breezes in the Eastern flanks of the Solent. A fickle wind from a range of quadrants of the east proved just strong enough to get the fleet to the race area. Nigel Russell quickly laid a start line and the first course but as the wind shifted another 30 degrees he took the opportunity to raise the black flag with two sound signals to indicate to the fleet to stop sailing and hold station for a minutes silence for to commemorate the lives of two recently departed Finn sailors, Mike Till and in the week prior to the event John Torrance. A sudden gust decended during the commemoration – Mike and John sending their approval perhaps?! Both had played a large part in holding the British Finn Association together, Mike as the Masters representative on the World Masters committee for many years as well as performing as a top sailor in the Masters events; and John as a tong time Finn sailor who carried much of the history of the class around with him and had recently become a class measurer. Both will be sadly missed. 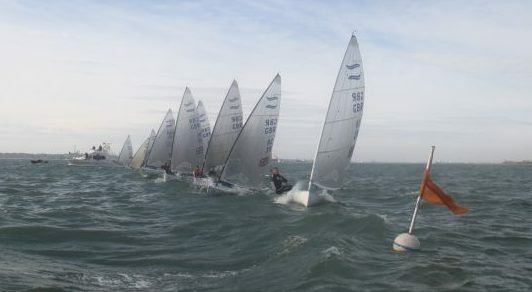 After one attempt to get the fleet off with a normal start, the punchy fleet combined with tide pushing them over the line inevitably led to a general recall and from then on all starts started with a black flag – possibly just as well as over the weekend 18 BFD results were recorded. In a light and shifty easterly the fleet completed a 3 circuit windward/leeward course. Allan Burrell took the race win, closely tracked by John Greenwood and Martin Hughes. Race two saw a similar start but some big shifts up the first beat saw the early leaders relegated to the back of the fleet. Under 23 sailor Markus Bettum got to the front on the first run and maintained his lead with fellow under 23 Mathew Stephens in pursuit. Al Burrell who was buried in the fleet at the first mark displayed some deft up-wind work to get back to take a well-deserved third place. Race three saw several last minute position changes but it was the turn of the grand masters to dominate again with John Greenwood winning, Al Burrell in second and Martin Hughes third. 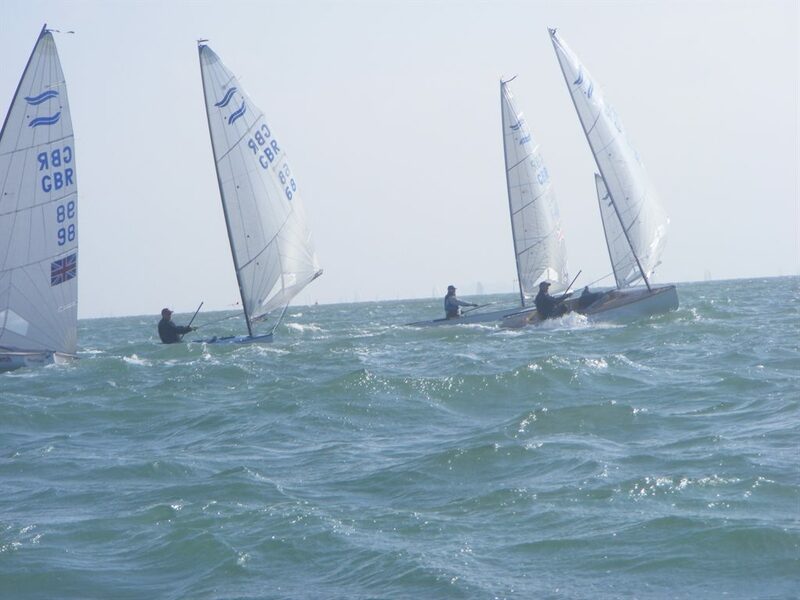 One sailor deserving a mention is under 23 sailor Cameron Tweedle who was desperate to prove his worth at the event – so desperate that he managed good results in every race only to find he had been awarded a black flag in all three races, this must be some record! Once ashore and following welcome tea and cakes the action moved to the end of season dinner. 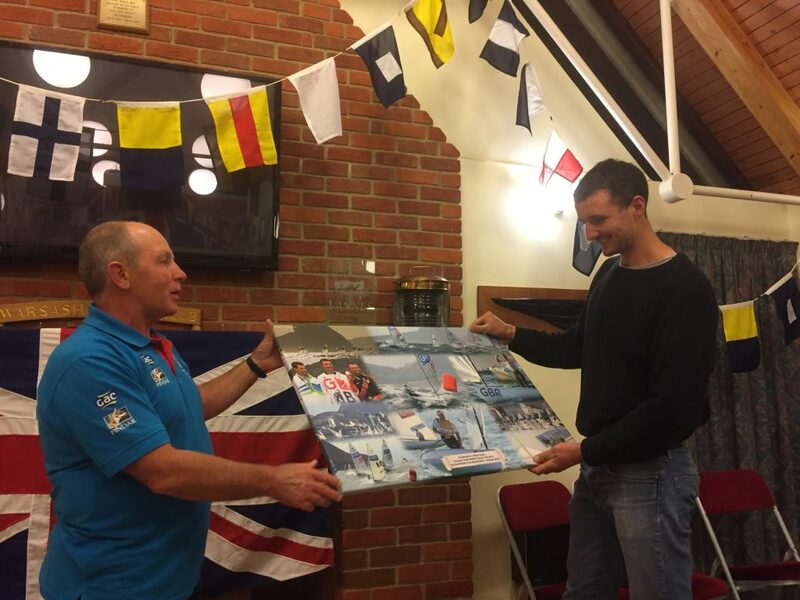 Rio 2016 Gold Medallist Giles Scott dropped in as the guest of honour and was presented with a framed photomontage of some of the most spectacular images from his victory in Rio, captured by Robert Deaves. A great three-course meal was supplied by Warsash Sailing Club as the beer and wine was devoured. Following the meal Cameron Tweedle, in between jibes about his collection of black flags was awarded the BFA travellers trophy which he won in fine style with top five results in all seven events. The trophy is a solid silver Finn with many famous Finn sailors names engraved upon it but Cameron is the first under 23 to take it. Sunday morning was always forecast to provide more easterly winds, but with a bit more bite. Following a drift down the river Hamble the excitement begun as the wind picked up to a gusty 18 knots for the first start. 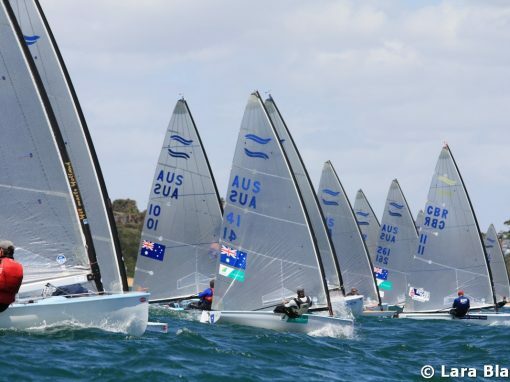 With all restrictions on pumping lifted the under 23 sailors begun to show the results of their training and skill as Cameron Tweedle took the first race followed by Callum Dixon, who missed most of Saturday with gear failure, and Markus Bettum in third. Race five saw the wind drop slightly and move more to the east but again after a flying pin end start Cameron Tweedle led the race from start to finish followed by the newest recruit to the under 23 squad James Skulczuk and Henry Bagnall who has just returned to the Finn fleet after a break of 10 years. 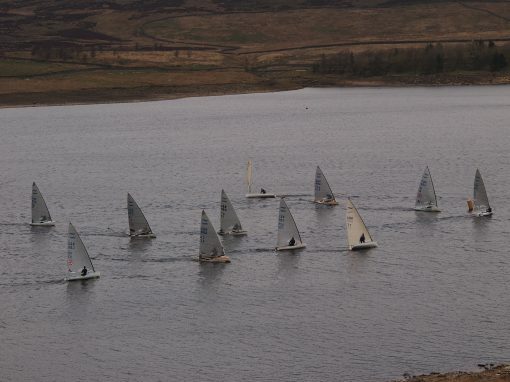 With a much reduced fleet the final race commenced. Leading all the way from the first mark Callum Dixon showed his metal taking line honours holding off the ever pumping Cameron Tweedle looking for his third win of the day with John Greenwood fighting through the fleet to take third. 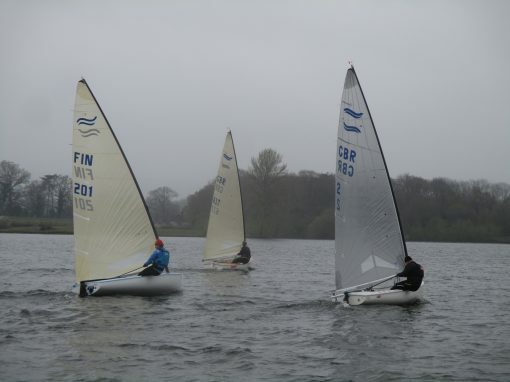 The mixed bag of results for all sailors provided a high scoring series but John Greenwood sailing his Petticrows Finn with a new design cross cut North MX5 sail took the final honours in an excellent end of season regatta. A big thank you to Nigel Russell and his race team who provided excellent safety cover, great courses but above all a rapid fire approach to starting each race immediately after the last one finished.